If you are considering a new notebook, you probably are already using or plan to add a WiFi network and who could blame you? The freedom to work from the couch without is liberating to say the least. 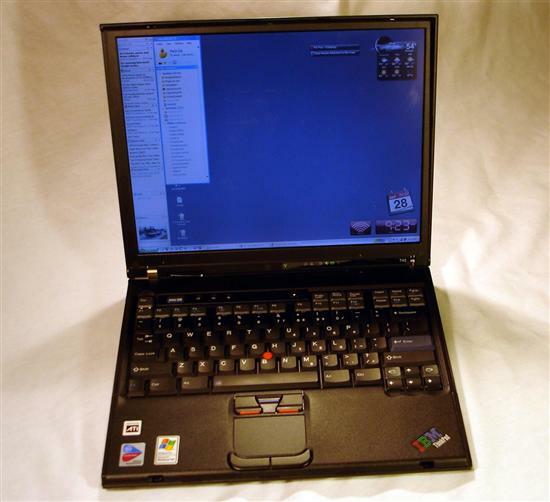 Like most Pentium M based notebook, the T43 is a Centrino system. This means that it uses an Intel chipset and an Intel WiFi chip in addition to sporting the Intel . While this may just be a brilliant marketing decision on Intel's part to sell more WiFi chips, at least they make good ones. You have a couple choices when it comes to the particular wireless chip, my system came with the Intel Pro/Wireless 2915ABG. As the name implies this supports 802.11a, 802.11b and 802.11g. IBM has a long standing reputation for excellent wifi range due to the placement of the antenna (around the LCD), but it this fact or mere urban legend? Hard to say, at the worst spot I could find in my house, about 35 feet and 3 walls away from my router, I has a signal strength of 100%. For comparison my Dell Inspiron 6000 also got to 100%. Bad test. Next I tried sitting in my car at the end of the driveway. Any more challenging? No, both systems once again came off flawlessly. Conclusions? Well, I haven't seen a problem anywhere that I've used the T43, but I don't think I've been pushing its capabilities either. The T43 is available with a either a 14.1” screen or a 15” screen. The 15” screen comes in three resolutions, a business friendly 1024 x 768, a more reasonable 1400 x 1050, and a solid 1600 x 1200. The 14.1” screen comes in just two, 1024 x 768 and, as in the review system, 1400 x 1050. I find this to be a good size/resolution compromise. The screen looks good with a great range of viewing angles and a no dead pixels, though it could be a notch or two brighter. Compared with the screen on my Dell Inspiron 6000 (15.4” @ 1680 x 1050) the T43 panel looks a little washed out. It just isn't as bright or as colorful as the excellent Samsung panel on the Dell. Part of the problem with the screens brightness is that the T43 has a very effective anti-glare coating. The current trend in more consumer focused notebooks has been to remove this anti-glare coating. While this can lead to truly gorgeous displays (Sony's X-Brite) under the right lighting, they are not suited to challenging lighting conditions (sun filled windows, the great outdoors, bright lights in general). Unfortunately it is either one or the other at the moment. I prefer the flexibility and practicality of a screen like the T43's over brighter, more glare prone screens. If you live in a dark room though, you might feel otherwise and in all honesty, the Dell screen is noticeably brighter without an major increase in glare. The T43 does two things very right when it comes to input devices. First, in has a great keyboard with a logical layout. Secondly, it has aTrackPoint. The gold standard for laptop keyboards is the IBM T series. It is a very nice place for your fingers to spend time. No other laptop manufacturer has surpassed it and few are even in the same league. It does lack a windows key though (does IBM have a grudge against Microsoft perhaps? ), for those who care. The TrackPoint, whether invented by IBM or simply perfected, is a significant boon to the T43. It provides real control and is located right in the middle of the keyboard where your digits spend most of their time. 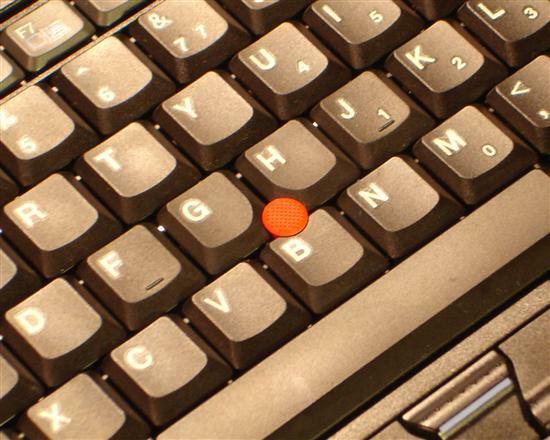 If you've used a TrackPoint (IBM or otherwise) you know what I'm talking about. If not then find one to try out. The TrackPoint is a much more usable pointing device than even the best touch pads. I find myself dragging my huge Microsoft track ball around less and less with the T43. Of course, bowing to the majority, IBM has included a small touch pad with all of the T4x machines. Not a particularly good one mind you, it is placed too close to the front edge of the notebook to be comfortable. Does lead to a couple interesting features though. You can actually use the touch pad as a scrolling device. The software will also let you launch applications / run commands by tapping the corners of the pad.